CHICAGO MED: Oh man, that illegal immigration story was painful. A lot of Gwen’s moves are to protect the hospital, but this….didn’t feel like that. Yes, it was following the letter of the law, but Natalie was correct: how many people will just not go to the hospital if they worry they’re jeopardizing their freedom? Speaking of doing the right thing but with very bad results, Will being a CI is going to wind up a total, total, total mess, huh? THE GOLDBERGS: Oh. My. God. Those guilt letters? Incredible. And the real Bev appearing at the end to talk about the letters she sent the real Adam Goldberg was hilarious. RIVERDALE: This feels weird, but the new season looks beautiful. The subject matter is dark and occasionally ridiculous, but it looks gorgeous. MODERN FAMILY: Dylan has always been my least favorite Haley boyfriend on the show, but with him seemingly maturing, I’m curious how they’ll work out now. SEAL TEAM: It was lovely to see everyone rally around Jason and the entire Hayes family in the aftermath of Alana’s death. 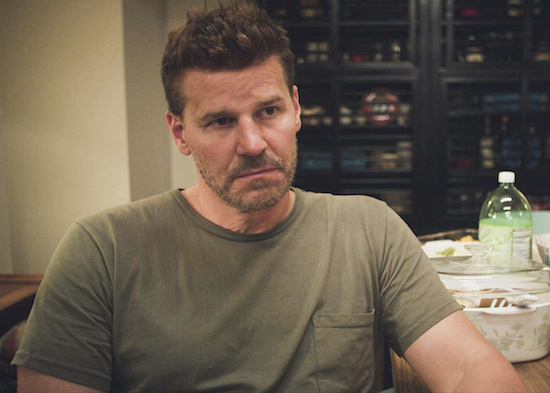 David Boreanaz is often at his best when his characters are dealing with deep, dark topics; he really rose to the occasion here. It was probably his best work of the series, thus far. It was nice to see the group come together for Friday dinner after the affair was revealed, but I’m curious how the relationships will be impacted when they’re not in a group together. And are Eddie and Delilah ever going to really talk about what happened? I’ve recorded Seal Team, Modern Family and A Million Little Things. After catching up on New Amsterdam, I watched Survivor and Single Parents last night. Survivor is the only show I make sure to watch on the night it airs and Single Parents is a better show than what Modern Family is now. We will watch Seal Team tonight. I’m a huge David Boreanaz fan since his Angel days. Single Parents is on my list to catch up on!